Cows have 4 stomachs, respectively, and in digestive order, named ‘rumen’, ‘reticulum’, ‘omasum’ and ‘abomasum’. 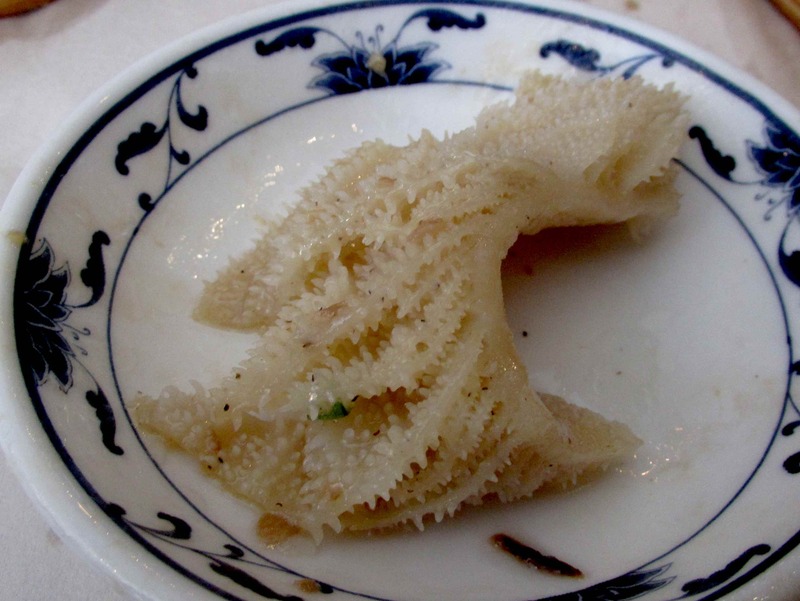 The fourth is used as a source of tripe far less frequently than the first three, while the reticulum, yields the ‘honeycomb’ variety and is probably the most common on Chinese restaurant menus. The first stomach, or ‘rumen’ yields a very smooth type of tripe, known as ‘blanket tripe, while the type you see pictured above comes from the ‘omasum’, or third stomach. After looking it up, I discovered that the translation of the second two characters means ‘hundred leaf’ or ‘hundred page’, and this reflects a common English name for the product, which is ‘Book tripe’. In this close-up, you can see why the names in Chinese and English are quite apt. The inner lining of the stomach is formed into delicate folds which, albeit with a slightly villous surface, do resemble the pages of a book. On an interesting side note, when I wrote about ‘Husband Wife Lung Slices’ a while ago, I mentioned having trouble identifying one of the components which, due to some linguistic confusion, was misidentified as ‘lung’ (even though I though it was possibly tripe). I can now confidently assert that the mystery meat was, in fact, cow omasum. Before trying it, I’d only heard of it as ‘omasum’ (my wife was in agricultural college when we met). You had more knowledge of 牛百葉 …! In fact I am nit sure the third character is correct. It is a popular dim sum in Cantinese reStaurant but not my favorite. It is the texture that i am not crazy about. What is that husband wife lung slices….? Name is really funny! The third character is the traditional form … the simplified version is ‘叶’. Traditional forms are still more common on Chinese restaurant menus here but that is slowly changing. 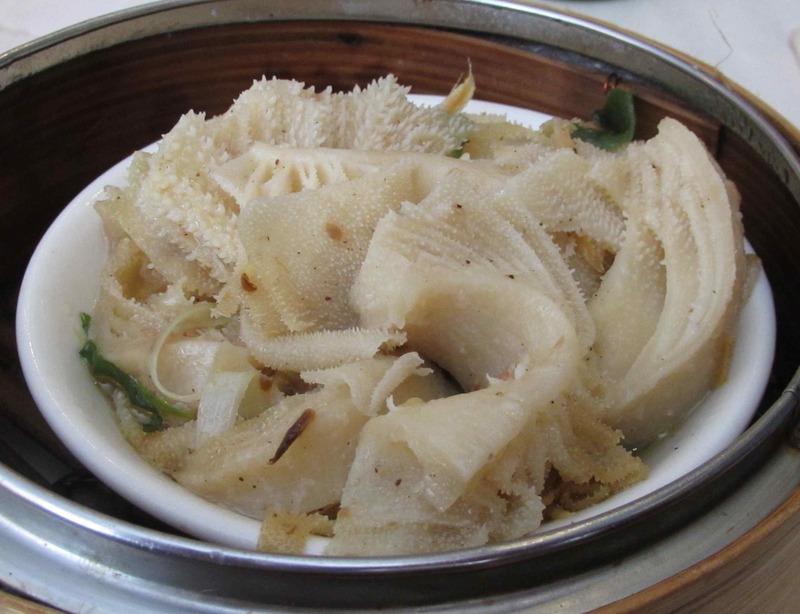 Not something I would order…I just don’t care for the texture of tripe. Very informative post! Loved reading it even though I am not a fan of beef tripe. I only eat tripe when my family cooks it. Usually Beef. I’ve seen them preparing it after slaughtering a cow in Bangladesh. It looks anything but appetizing! I actually quite like tripe! But it has to be done really well, or I don’t want it. I never thought about the different stomachs having different textures before. It seems so obvious now that you have mentioned it. I liked this one better than the ‘honeycomb’ type. Your a brave person for giving this a try. I learned alot from this post.